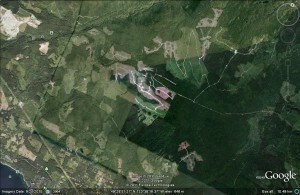 This aerial view (provided by Google ) shows the extent of logging on the lower slopes of the Mt Elphinstone area, above the village of Roberts Creek. The largest of the clearcuts is the infamous 160Ha (400 acre) CNI (Columbia National Investments) cutblock on their private lands. CNI was later charged on a fisheries violation for logging completely through a fish bearing stream. The other cutblocks seen are BC Timber Sales clearcuts. A proposed BCTS Block A87124 would connect up with the CNI clearcut on its southern boundary, adding to the total de-forested area.